What is the free fall definition? 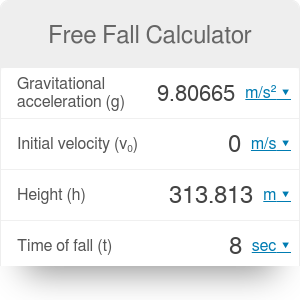 This free fall calculator is a tool for finding the velocity of a falling object along with the distance it travels. Thanks to this tool, you will be able to apply the free fall equation for any object, be it an apple you drop, or a person skydiving. Read on to learn the free fall definition and discover the most daring examples, including the highest free fall in history (spoiler alert: it broke the sound barrier). We'll also explain what is the free fall acceleration and why we assume it's constant. Make sure to have a look at the projectile motion calculator, which describes a particular case of free fall combined with horizontal motion. In free fall, an object moves under the influence of gravitational force only. The only acceleration is the acceleration of gravity g. No other force, including air resistance, is acting on such an object. What's interesting, an object in free fall doesn't necessarily need to be falling (that is, moving downwards). For example, the motion of the Moon satisfies all of the conditions listed above: there is no other force acting on it than the gravity (it's being pulled towards the Earth), and there is no air resistance, as there is no air in space. Why doesn't the Moon crash into Earth, then? It's because Moon's speed is not directed towards Earth, but tangentially to its orbit. Since the Moon is moving along an elliptic orbit with the first cosmic velocity, its motion generates a centrifugal force, equal and opposite to the force of gravity. g is the free fall acceleration (expressed in m/s² or ft/s²). Without the effect of air resistance, each object in free fall would keep accelerating by 9.80665 m/s (approximately equal to 32.17405 ft/s) every second. In reality, though, the velocity of a falling object is constrained by a value called the terminal velocity. What is the terminal velocity? As you have seen above, the free fall acceleration is constant, which means that the gravitational force acting on an object is constant, too. The force of air resistance, however, increases with increasing free fall speed. At some point, the two forces become equal in magnitude. According to Newton's first law, at that point, the falling body stops to accelerate and moves at a constant speed. This speed is the terminal velocity. In this free fall calculator, we neglect the influence of air resistance. If you want to consider it, head to our free fall with air resistance calculator. You can immediately see that the object distance traveled is proportional to the fall time squared. It means that with each second, the falling body travels a substantially bigger distance than before. Another interesting fact is that according to the free fall formula, the distance does not depend on the mass of the falling object. If you drop a feather and a brick, they will hit the ground at the same time... Or at least that's what science says! If you try to perform an experiment, you'll notice that in reality, the brick falls to the ground first. Why does that happen? Again, because of air resistance. If you dropped the two items in a vacuum, they would both hit the ground at the same instant! Still not sure how our free fall calculator works? Don't worry - we prepared a simple example to walk you through it. Determine the gravitational acceleration. On Earth, this value is equal to 9.80665 m/s² on average (which is also the default value set in the free fall calculator). Decide whether the object has an initial velocity. We will assume v₀ = 0. Choose how long the object is falling. In this example, we will use the time of 8 seconds. Calculate the final free fall speed (just before hitting the ground) with the formula v = v₀ + g * t = 0 + 9.80665 * 8 = 78.45 m/s. Find the free fall distance using the equation s = 0.5 * g * t² = 0.5 * 9.80665 * 8² = 313.8 m.
If you know the height from which the object is falling, but don't know the time of fall, you can use this calculator to find it, too! You might already have learned the free fall equation, but it's one thing to understand the theory and a completely different one to experience it. There are many ways to experience the thrill of a free fall - you could, for example, jump with a parachute or try bungee jumping! One of the most extreme examples of an almost-scientifically-correct free fall is the jump of Dr. Alan Eustace, Google's VP of Knowledge, in 2014. Eustace jumped from a heart-stopping height of 135,908 feet (41,425 m), thus setting a new record for a parachute jump. Surprisingly, Eustace declined Google's help in the jump and funded the project himself. It's not an easy endeavor, because such a leap required him to go up in a special balloon, and wear a custom-designed spacesuit that protected him from sudden shifts in temperature (after all, he was jumping from the edge of space). The fall itself took 15 minutes, and the maximum speed exceeded 800 miles per hour - far over the sound barrier! Free Fall Calculator can be embedded on your website to enrich the content you wrote and make it easier for your visitors to understand your message.